Logo Design: How much does a logo cost? It has to be the most common question I get asked, “How much does a logo cost?”. I am really transparent about my Logo Design packages and publish my prices on my website. Hiring a good, reputable graphic designer will help ensure that your logo and your branding do all of those things and more. They’ll provide a total design and support service, taking time to understand your business and how you want to be perceived by potential customers, they’ll also take a peek into your personality to ensure that your logo represents not just your business but you. They’ll provide multiple options, offer you the opportunity to make amendments and provide you with your finished logo in a variety of formats along with detailed brand guidelines that you can hand over to you VA, website developer or copywriter. But as you know you can also DIY your own brand too. There are so many tools out there today online and the most obvious advantage of designing your own brand is that you could save yourself hundreds, if not thousands of pounds. However, remember that there are legal implications of using different types of fonts and graphics, so be sure to do your homework. Also, ask yourself if you have the skill set, know how or the time to DIY your logo. There are numerous different file types, formats and resolutions depending on intended purpose. Using a logo file for offline printing such as signage, brochures and the like, will differ from a file used online on social media banners and memes. My three bespoke Graphic Design Packages; and My online branding and logo design course: Beautiful Brand Bootcamp. So how much does a logo cost and why is it so varied? Every Graphic Designer charges differently for logo design and the scale can vary greatly. Packages. So what’s included within the project, not just a logo, other assets can also be included such as business cards, social media banners, webinar templates etc. Differentiation – so for instance I am not just a designer. I have a degree in Marketing with Design. In addition I have almost two decades of hands on experience working in many different Marketing departments, in both large and small organisations. I’ve always been the ‘hands on’ designer – that makes me different. I know about the branding, graphic design and marketing and how they all work in harmony together. I am a designer and branding coach all rolled into one. Can I get a logo for $5? You can go to Fiverr and pay – yup five dollars for a logo. Once of my customers (she is now following the disaster on Fiverr) did commission work for a logo but it didn’t cost $5. By the time she added on revisions, it was way more than that. She then went on to launch her business and then had a Cease and Desist letter from another business who’s logo and branding was VERY similar. Sometimes for small graphics etc Fiverr is great and I’ve heard some people say it’s worked for them. In my opinion you really do get what you pay for – no guidelines, no vector files (important for you as you grow your business), no delivery of multiple files, no consultation, no discovery questionnaire, no one to one – no personalisation, no uniqueness and they can use stock clip art graphics. Logo design often costs a lot less than having a complete brand designed. Quite often Graphic Designers will offer a logo design only package, which can include a consultation, a couple of logo concepts and a few revisions. Included in that logo package should be file variations of your logo so you can use it on and offline. What you do with that logo is then up to you in terms of designing and styling your brand out. You’re kind of left to your own devices so-to-speak to go out there and place your logo on everything and create your own style. Unless of course, your designer has a great marketing head on them and explains what you should do with your logo next to start building a brand. Your package might also include a brand guideline document outlining your fonts, colours used within your logo and the overall feeling for your brand. Essential to help you create ebooks, Facebook cover photos, Twitter banner, webinar templates and business cards and the like. Logo only packages vary greatly and you can expect to pay £60-1000 ($70-1100 approx.). Again this depends on experience of the designer and whether the designer is a junior, senior, or freelancer. How much did some of the most recognisable logos cost? Nike – £28 ($35) – they did go on to give the designer 500 shares in Nike! Ok some of these examples are from one extreme to the other. But as you can see there doesn’t seem to be an average price for a logo design – costs for a logo vary on many different elements. The larger more established brands tend to choose branding agencies like Saatchi & Saatchi who are at the top end of the scale and by that I mean off the scale and out of reach for the average female entrepreneur or any new business startup. How much is a logo from Vicki Nicolson Branding Therapy? My pricing structure is a reflection of how I work with you, my expertise in branding, design and my vast understanding of how that aligns with your marketing. From inspirational brand identity to timeless logo design and much more. I do way more than design. I spend time with you. We work together to brand your full business. I create and design a tailored magical brand that will literally transform how you look and how you feel about your business. And in addition you also get continued email support when you need it. And it’s all me. No one else. Just me. I don’t outsource any parts of my business other than my invoicing and general admin. The branding and design is all done by me. I also offer payment plans too – this allows flexibility and affordability for you – you get to work with me right away, you get to spread the cost so it doesn’t feel like a massive chunk of money all at one time – ultimately you get a professional brand you’ve always wanted. It’s not just a logo you get when working with me, it’s a complete brand and one that should last you for the lifetime of your business. My packages include a full suite of assets to springboard your brand as well as an in-depth set of guidelines to pass on to your web designer, refer to everyday and ensure you stay on brand so that no matter where your customers find you, you look and feel the same. What overall impression am I trying to convey? Will I get scalable logos in all formats from the designer? Will I compromise on quality? Do I want a quick logo to get my business started and think about rebrand later on? Get a low cost logo now – what are the cost implications of rebranding professionally later on? Can I charge my worth with a cheap looking logo? What image do I want to present? Will I need a website too? How much is my budget for my website? Will I get to work one to one with the designer? Does the designer outsource any parts of the design process? Will the designer understand my business? Do I want to work with a local designer or an online designer? Do I know what I want and need a designer to draw out? I have a sketch of what I want, will a designer be able to redraw that? How many logo concepts would I like? You’ll see that some of the questions will take a bit more research but any designer worth their weight in gold will hold your hand throughout the process and you’ll see from my packages and the way I work with you, it’s worth way more than a fiver. You get me, my experience, my expertise, my time and my effort so that you can charge your worth, radiate your passion and shine online. I immerse myself in your business to get a full and in depth understanding of your goals and what you want to achieve for your brand, who you want to attract and how it will serve you for the long term as you grow. On a final note – shop around, check out other designers and work with the one that feels good to you – one that you know you can work with and one that will make branding your business a breeze. See if they do free consultations to get a feel for them. Check out their portfolio, testimonials, social media channels, what’s their vibe like, do you connect with them, do you like their work? How much does a logo cost if I DIY? Well, it depends… let’s say you use free software like Canva or PicMonkey, you logo may not cost much in terms of design, but how long is it going to take you? And would your time be better spent making money in your business? If you’re using the same limited fonts, graphics and colours as thousands of other people, how unique is your logo really going to be? Will it represent you and your business? Will it stand out? I answer all these questions and more in my branding and design course Beautiful Brand Bootcamp. It’s a comprehensive online course that will transform you from design dunce to design diva in easy-to-follow modules that you can work through at your own pace. It will help you pull together your branding quickly, set up branding templates with ease (there’s even templates in the course to help you get started quickly). It will show you how to design like a pro so you can inject professionalism across your brand, ensuring your look is consistent and professional. And it’s only £279 – a fraction of the cost that professional design would cost you. I hope I’ve answered the question, How much does a logo cost?, in the best way I can but please remember logo design prices vary massively from designer to designer. Want to check out my bespoke branding and logo design packages? Click here. 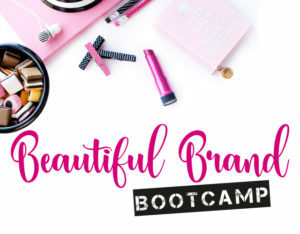 Want to find out more about Beautiful Brand Bootcamp? Click here.